" I just got the ARREL Audio CL 125/4 and I love it. This unit makes my drums sound like I hear them in the room, they just come alive! The transients are clear and with great definition, and it also has excellent headroom. I can hear and feel the touch of my hands on my hand drums, they just jump right at you. What else can I say... I just love this unit." Luis Conte's genius stems from his ability to integrate the powerful rhythms of his native Cuba with the American necessities of American pop music. His long and varied career has included numerous Hollywood film scores and mega-successful albums with Madonna, Ray Charles, Phil Collins, Santana, Shakira, Jackson Browne, Sergio Mendes, Cachao, and a multitude of other artists too numerous to mention. Born in Santiago, Cuba, Luis spent the first 15 years of his life soaking up the rich musical heritage of "El Son" and Carnival. "Life in Cuba is all about enjoying life, and music is central to that lifestyle," Luis says. "Music is almost like food to Cuban people." While immersed in the music of his native Cuba, Luis also developed a passion for Rock & Roll, R&B soul music, jazz, and the Beatles. 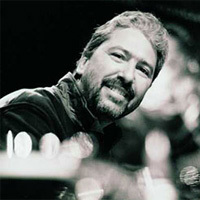 Some of Luis' musical influences: All the drummers that play in Carnival in Santiago, Tata Guines, Mongo Santa Maria, Papin, Patato Valdez, Armando Peraza, Francisco Aguabella, Airto Moreira.